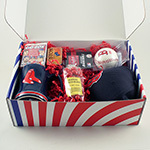 Our premier Boston Red Sox gift set. Enjoy the Sox games with peanuts and munchies along with the necessary Red Sox gear. Included in this set are the following: adjustable navy wool Red Sox cap with raised B emblem; replica autographed Red Sox baseball with autographs of the players on the Red Sox roster; large 12 ounce bag of roasted Red Sox peanuts (no salt); plush 8" tall Wally; 6 ounce bag of New England salt water taffy; and two large 8" tall strawberry lobster pops. Items come packaged in a Red Sox team logo five quart pail with handle. Pail is made of rust resistant galvanized steel and has a full color large team logo on the front. The pail bottom has a waterproof seal which makes it great for holding ice, water or dirt for plants. Measures 7" high x 9" diameter.